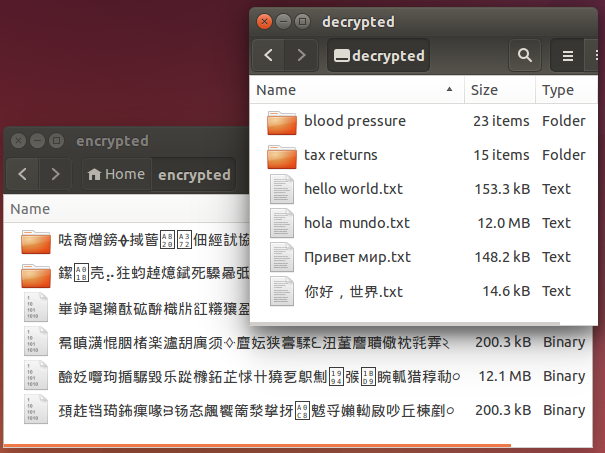 Mount your encrypted files and directories and instantly access them like regular files. With transparent real-time encryption and decryption, ScramFS Mount secures your files while you use them. The friction points normally associated with encryption simply disappear. There's zero effort to properly encrypting your data when using ScramFS Mount because every file that's written to the virtual mount point is automatically encrypted on demand. This means users can stay protected, even if forgetful, careless or lazy. The ScramFS Mount interface also gives users some amazing advantages over other encryption technologies. Encrypted files suffer a usability problem – when they’re encrypted, they’re impossible to use until they have been decrypted. And for many encryption programs, decryption is a separate step that requires extra time, effort and temporary disk space. ScramFS Mount solves this problem by making encrypted files instantly accessible and usable. Compared to other types of encryption, this offers many advantages in usability and security. To encrypt the video… 1. Mount a directory with ScramFS Mount. To playback the encrypted video… Run video player on virtual mount of encrypted video. 1. Extract video to a temporary file. 2. Run video player on unencrypted video. 3. Delete the temporary file. 1. Extract video to a temporary file. 3. Delete the temporary file. Pros and cons ✓ Video playing starts immediately. ✓ No temporary space needed. ✓ No leakage of plaintext to disk. ✘ Need to wait for video to extract and decrypt in full. ✘ Need temporary disk space. ✘ Leak plaintext to disk. ✘ Need to remember to delete temporary unencrypted video file. ✘ Need to wait for video to extract and decrypt in full. ✘ Need to remember to delete temporary unencrypted video file. The majority of applications do not encrypt their data files. With ScramFS Mount, it’s easy to instantly “add” encryption to your applications by saving to the mount point instead of directly to storage. This is a great way to protect sensitive files when they’re stored on portable media or in the cloud. As shown above, to use ScramFS Mount your application writes to the mount point (such as /mnt/private), and ScramFS transparently encrypts the saved files in memory and writes them to the storage file system. Decryption merely reverses this operation. The advantage of this is that no changes are required for existing applications to work and security is assured automatically through ScramFS. There are a great number of applications of this – such as encrypting Git repository files; encrypting spreadsheets and word processing documents; encrypting private notes, photos and videos, just to name a few. ScramFS Mount is currently available for Linux. We are currently working on expanding this support to other operating systems. If you are interested in our ScramFS Mount functionality, please contact us to register your interest so we can keep you informed of our progress. Contact us: ask a technical or sales question. © 2017-8 Scram Software Pty Ltd. All rights reserved.